We want to continue to spread awareness about “Move for Hunger”. Several Bekins agents are participating, and you can help too. Here’s an article by Eric Anders that we wanted to share to bring even more visibility to this important cause. When I first wrote about Move for Hunger a little over a year ago, the relatively new industry organization was just starting to spread it’s wings. Move For Hunger is a 501 (c)(3) non-profit established by Adam Lowy in August 2009. Its goal is to strengthen the efforts of community food banks throughout the country by leveraging an existing network of specialized transportation companies and state and national moving and storage associations to create one of the largest, year-round food service programs. At just 23 years of age, Adam is an industry veteran who grew up in the family business, Lowy’s Moving Service, that his great grandfather founded in Neptune, New Jersey. Recently, Do Something.org selected Move for Hunger as one of the five finalists to participate in the 2011 Do Something! Awards. DoSomething.org is one of the largest organizations in the U.S. that encourages young people to create a culture of volunteerism by promoting social causes they care deeply about. The Do Something Award is the premiere national award devoted to the promotion of social change by those under the age of 25. The young people nominated represent the most pivotal people in their field or cause and are dedicated to making a difference. On Thursday, August, 18, 2011, the Do Something Awards aired on VH1. Move For Hunger was the ONLY hunger-relief organization nominated for the $100,000 Grand Prize. Although Lowy was not selected to receive the huge monetary reward, the national exposure and public support his non-profit organization received is probably worth every bit that amount. What started as one young person’s personal goal to help feed the hungry in New Jersey now involves over 150 dedicated movers in 34 states. Together they’ve collected over 200,000 lbs of food to help fight hunger throughout the country. Using the Move for Hunger framework started by Adam and the national exposure provided by Do Something.org, the full-service moving and storage industry and their relocation partners have a tremendous opportunity to make a measurable impact on our nation’s fight to overcome hunger in communities all across America. 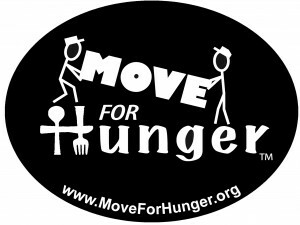 If you are a mover or know a mover, click here to learn how to join the Move for Hunger crusade. One in eight families in this country need your help!